The Danish Equestrian Federation is imposing limits on noseband tightness across all disciplines, based on the findings of a major study involving 3000 horses. The scientific study was launched by the federation in 2014 to examine and record the various types of equipment used on competition horses, including bits and nosebands, in a bid to clarify their impact on the animals. The federation has released only a summary at this stage, as the complete findings are destined for publication in a scientific journal later this year. A horse clearly having difficulty breathing due to the extremely over-tightened flash. However, the information given to the federation’s board has persuaded its members to introduce limits on noseband tightness. The federation said in a statement that the study had shown a clear correlation between tight nosebands and the presence of mouth lesions. “We do not want the use of equipment in the sport to cause lesions in the horse’s mouth,” it said. The new rule will be place from January 1. It will requires that a noseband on a horse must be able to accommodate a certified measurement unit in between the nasal plate of the horse and the noseband with a diameter of 1.5 centimetres. It is understood that measurements may start soon, but no sanctions will be imposed in 2017. From 2018, officials will check noseband tightness in circumstances where they suspect it is too tight. If it is too tight, the rider will be asked to loosen it to meet the requirements, after which the rider will be able to compete. 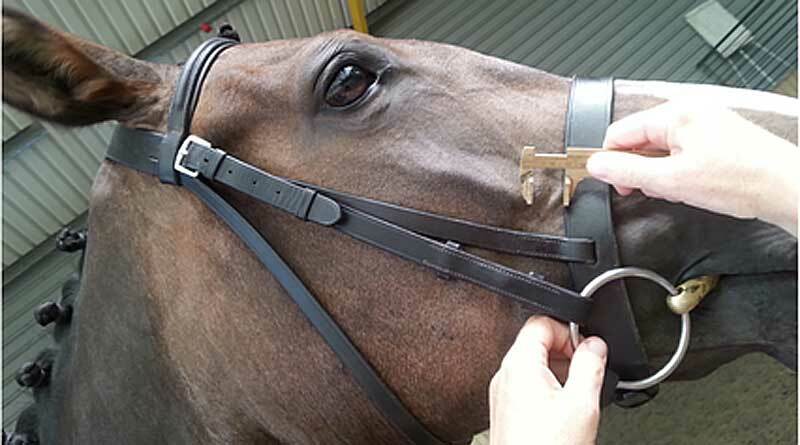 Traditionally, the noseband has been measured with one or two fingers, and different types of noseband measurement devices have also been developed. To secure reproducibility, the measuring device adopted by the federation will have a specified diameter of 1.5 centimetres. The rule will apply to all types of nosebands, both upper and lower. Measuring the width of a noseband. The study that prompted the new rule involved assessments of 3000 horses involved in dressage, show jumping, eventing and endurance. In the study, the type of bit and noseband was recorded, and the tightness of the noseband was measured. The corners of each horse’s mouth were inspected for lesions and blood. A number of horses were found to have oral lesions, most of them in dressage. The researchers found there was a clear correlation between noseband tightness and oral lesions. The tighter the noseband, the more oral lesions were recorded. Horse and rider combinations at higher levels of competition had a higher prevalence of oral lesions than at lower levels. Based on these findings, the Danish federation’s board concluded that the regulation of noseband tightness was an important area of focus in order to reduce the frequency of oral lesions in competition horses at all levels. In relation to spurs, the federation said the researchers found that a low proportion of horses had lesions or worn hair at the ribcage. For all riders, a relatively longer spur presented a significantly greater risk of finding hair on the spur and worn hair on the horse ribcage compared to a shorter spur. “We are pleased that the occurrence of damage from spur is relatively low, but we will use the results and the relationships that have been demonstrated as a tool for future equipment control and training of riders,” the federation said. The study revealed very few lesions due to whip use, based on an examination for lesions and swelling around the forequarters and hindquarters. The FEI national head veterinarian, Mette Uldahl, had overall charge of the research project. The federation said it hoped that the study findings would contribute evidence-based knowledge of equestrian equipment and its impact on horses. An excellent step ahead of Barbarian customs.Specially to point out a generally ignored “second incidence” of caveçon (muserolle in French) tigntening”. Due to the tronconicity of the horse’s face, the tightening of the “caveçon part “(horizontally) provoques extreme tightening of its “crown part” , rendering impossible to slide a finger under it, where it crosses the poll behind the hears, and leaving a deep perspirating “gutter” when unbridled. The Danes should add the checking of the crown tightness as well ! On top of that, recent experimentations have enlightedthe fact that the face and the head of the horse engage into dilatation of the head at effort (protocole :1800m canter) both lateral parts mooving laterally and forward (horse’s head flatening towards the design of an alligator’s head , both eyes” facing” forward ,on each side of a central axe,vertically cutting the nose.This process considerably enlarge the inner volume of the air intake (by the flattening of the palate under tongue’s “vacuum” succion). Many permanent visible deformations of the nose come from the tigth/wide caveçon , “circling still” this dilatation on the weaker cartilaginous part of the head, and nasal bone. This altogether triple the thightening impact on breathing conducts and systems.